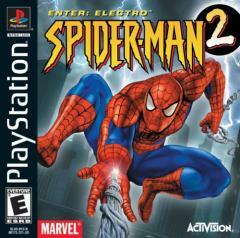 Spider-Man is back on the PlayStation in the sequel Enter Electro. Its time to suit up once more as the famous web-slinger and take to the streets again to stop the crimewave. Even more of Spideys enemies are in town leaving a trail of destruction behind them. They must be stopped at all costs, and dont forget to take a few photos for the Daily Bugle while you're at it. Spider-Mans superhero abilities make for perfect special moves. Spideys homemade webbing allows him to swing through the New York skyline, fire webs at enemies to ensnare them, and webbing can even be used to form a protective dome. Stealth also makes up an important part of the gameplay. Sure, you can run into precarious situations fists blazing, but sometimes the best way is to gain a tactical advantage by sneaking about on the roof, dropping in behind enemies and taking them out from behind. Spider-Man 2: Enter Electro is essentially more of the same, and there is nothing wrong with that, as fans of the original will testify. Naturally, there are new locations, enemies, storylines and special abilities on hand. Spidey can now make use of power-ups such as ice, electric webbing and damage reduction armour. Like the first game, the incentive to complete the game repeatedly is still there. Spider-Man 2 has literally dozens of hidden characters, game modes, and other additional Easter eggs hidden with its code. If you enjoyed the first game, and who didnt, then this sequel will continue to entertain. If you missed the first instalment, then this sequel will bring you gaming joy. This game is probably one of the last great titles to be released for the PSOne. Now well just have to wait for Spider-Man 3 on the PS2.